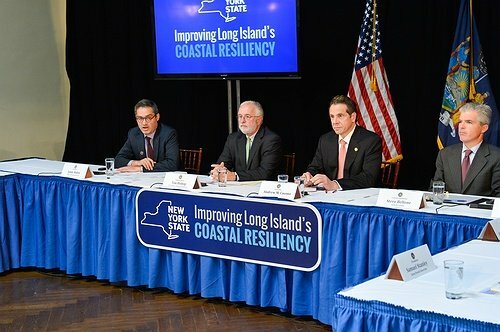 Long Island, NY - October 28, 2014 - Governor Andrew M. Cuomo today announced a series of actions to bolster coastal resiliency against future storms on Long Island by improving local water quality and reducing harmful nitrogen pollution. Superstorm Sandy significantly impacted Long Island’s wastewater treatment facilities and highlighted how vulnerable the region’s bays and salt marshes are to excessive nitrogen pollution. To help address these recovery needs, Governor Cuomo announced the State has identified $383 million in funding for proposed sewer projects in Suffolk County and that the State will advance $97 million to Nassau County for upgrades to the Bay Park sewage treatment plant. To help further ensure that the best available science and best practices exist to support resiliency and water quality improvement efforts, Governor Cuomo also announced the establishment of the New York State Center for Clean Water Technology at Stony Brook University – initially tasked with developing and commercializing the next generation of nitrogen removal technology for on-site septic systems and cesspools. All of these initiatives will help to continue strengthening Long Island’s wastewater treatment systems and reduce nitrogen pollution, which will help protect and improve coastal resiliency. Nitrogen pollution damages coastal marshlands that are a critical line of defense against severe storms and flooding. Governor Cuomo today identified up to $383 million for four proposed resiliency and water quality projects to extend sewers in Suffolk County in four areas, which County Executive Bellone advanced. Subject to federal approval, the State has identified up to $300 million in Community Development Block Grant Disaster Recovery funding and $83 million to be financed through low-interest loans from the Clean Water State Revolving Fund administered by the New York State Environmental Facilities Corporation and the Department of Environmental Conservation. 1. Forge River Watershed centered around Mastic: An estimated $196 million project would address storm impacts and reduce extensive nitrogen pollution to the Forge River and Great South Bay. The proposed project would connect parcels in the area to a new sewer collection system that will flow to a new wastewater treatment plant (that would include nitrogen treatment) located on municipal property near the Brookhaven Town Airport. 2. Carlls River Watershed centered around North Babylon and West Babylon: An estimated $136 million project would address storm impacts and reduce nitrogen and pathogen pollution in the Carlls River and Great South Bay. The proposed project would connect parcels to the Bergen Point sewer system within the Southwest Sewer District. 3. Connequot River Watershed centered around Great River: An estimated $33 million would be used to address nitrogen pollution and pathogens in Connetquot River, Nicoll Bay and Great South Bay. The proposed project would connect parcels to the Bergen Point sewer system. 4. Patchogue River Watershed centered around Patchogue: An estimated $18 million would be used to address nitrogen and pathogen pollution in Patchogue River and Great South Bay. The proposed project would connect parcels to the Patchogue sewer system within the Patchogue Sewer District. The State will advance $97 million to Nassau County to help expedite upgrades at the Bay Park sewage treatment plant. The state funding is an advance on the $830 million in federal funds Governor Cuomo helped secure to repair elements of the Bay Park plant’s treatment and collection system, and to achieve an engineered resiliency against a 500-year storm. The Governor is continuing to press his request to the Federal Emergency Management Agency for public assistance funds to create an outfall well out into the Atlantic Ocean and to install a mid-stage nitrogen treatment system to improve water quality in the back-bay, and protect extensive marsh islands in that area that serve as natural flood protection barriers for southern Nassau County. Currently, technology does not exist to effectively remove nitrogen from septic system and cesspool effluent in an effective and cost-efficient manner. These are the major sources of nitrogen that is polluting Suffolk County’s waterways and destroying protective wetland habitat that is vital to improving storm resiliency. Stony Brook University’s New York State Center for Clean Water Technology will research, develop and commercialize the next generation of technology to remove nitrogen from septic system and cesspool effluent. The Center will establish New York State as a global leader in this industry as this technology could help communities on Long Island, across the nation and around the world address this issue. Governor Cuomo, Suffolk County and Stony Brook University have agreed to designate $2 million from this year’s budget as initial seed money to establish the Center as part of a larger long-term initiative. Stony Brook University will dispatch the appropriate human capital resources including research faculty and graduate students, and designate laboratory facilities to anchor the work to research projects needed to move the initiative forward. Samuel L. Stanley Jr., M.D., President, Stony Brook University, said, "Stony Brook University is committed to this extremely important initiative that, through research and technology transfer, will help identify and establish new resources to improve water quality on Long Island for the near- and long-term. We thank Governor Cuomo for this financial and environmental commitment, and for entrusting this important piece of the puzzle to Stony Brook University. Thanks to that commitment, I’m confident that our students and faculty will make significant contributions to this initiative." The State today also released a report that identifies immediate and long-term steps to address excess nitrogen pollution that causes the degradation or collapse of coastal wetlands that provide natural storm defenses and numerous water quality problems. Governor Cuomo directed the state Department of Environmental Conservation (DEC) to work with state agencies, Suffolk County, Nassau County, Stony Brook University, and a host of civic, environmental and business leaders to develop the report. As part of that initiative, state leaders, along with Nassau County Executive Ed Mangano and Suffolk County Executive Steve Bellone hosted three public meetings in Nassau and Suffolk counties in May to discuss Long Island wastewater management and clean water infrastructure. These sessions included presentations by 40 scientists; federal, state and local officials; community, business and environmental organizations; and also provided an opportunity for the public to share their experience, ideas and concerns. The report is the culmination of independent research and strategies presented at these meetings. A copy of the report is available here. Congressman Steve Israel said, "Ensuring superior water quality on Long Island is important to our communities. As we prepare for future storms and bolster our resiliency, I am pleased that all levels of government are working together to improve and strengthen our infrastructure." Photo via Governor Cuomo's Official Flickr Page. Subject: LongIsland.com - Your Name sent you Article details of "Governor Cuomo Announces Actions to Strengthen Coastal Resiliency Against Future Storms on Long Island"